Speaking of food and music, recently Dr. Alison Stimpert, myself, and colleagues at Duke University published a paper that I think you’d all enjoy hearing about. In 2009 and 2010, we spent two field seasons studying humpback whale feeding ecology in Antarctica. Antarctica is one of the most breathtakingly beautiful places I’ve ever been, and it seems that the humpback whales like it, too — we recorded one of the densest assemblages of humpback whales in the world in Wilhelmina Bay, one of the secluded and serene bays packed with humpbacks feeding on amazingly large aggregations of krill during the Austral fall. These whales spend about half their time on breeding grounds in warm water, and then travel hundreds to thousands of miles (aka “migrate”) to spend about half their time feeding in the chilly Antarctic water of the western Antarctic peninsula. To read more about how many whales we counted, click here. A tagged humpback whale surfaces in Antarctica. Our recent paper focuses on the observed behavior of the humpbacks as they were indulging in all that krill. These were the fattest and sleepiest humpbacks we’d ever seen! The whales would sleep all day and feed all night. We could observe them during daylight hours, which dwindled every day as winter approached. We took advantage of the light and tagged the whales with non-invasive, suction cup acoustic tags, called DTAGs. We programmed the tags to stay attached for 24 hours so we could observe them remotely overnight. While on the whale, the tags recorded pitch, roll, heading, acceleration, depth, temperature, and acoustics. Acoustics recorded were vocalizations of the tagged animal, nearby animals, boat noise, and any other noise in the tagged whale’s surrounding environment. Simultaneously, we used echosounders (aka fancy fish finders) to locate and quantify the large swarms of krill in the water column. An example of a large krill aggregation, courtesy of Dr. Meng Zhou, University of Massachusetts. Now comes the cool part. Once the tag fell off the whale, we recovered it and downloaded all the data it recorded to recreate a four-dimensional picture of what was happening while the whale was feeding. In 2010 we were able to tag 10 whales in total! 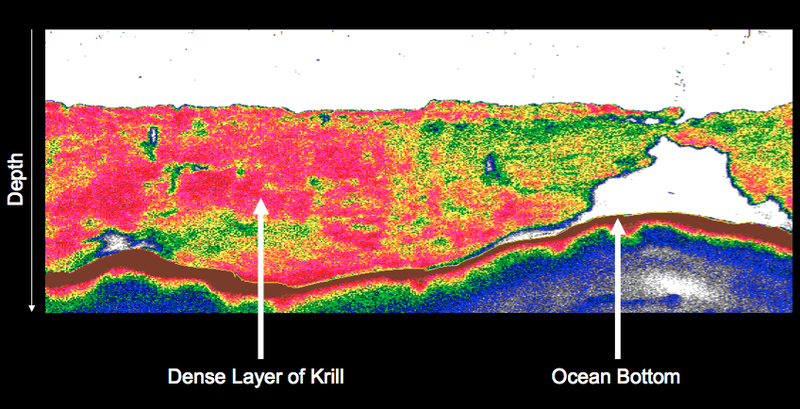 Overlaying the information about the layers of krill and the whale dives, we learned that the whales dove (300+ meters deep) all night long. We also recorded chorusing (several whales singing at once) on all 10 of the tags. 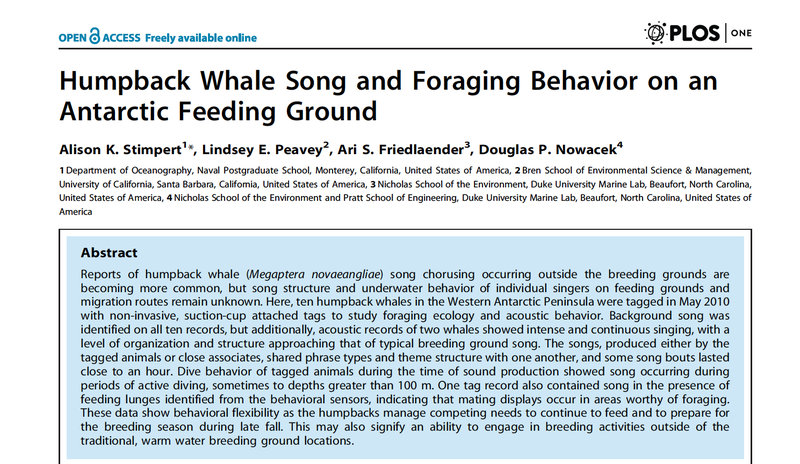 This is a very interesting finding because typically humpback whale song has been recorded on breeding grounds, as it is presumed that only males sing in association with mating. The production and function of song is not fully understood, but some theories include that song is used to show aggression towards competing males, as a form of biosonar, to serve as a migratory beacon, and/or to synchronize estrus in females. Basically, we still have a lot to learn about how, why, and where humpbacks sing. 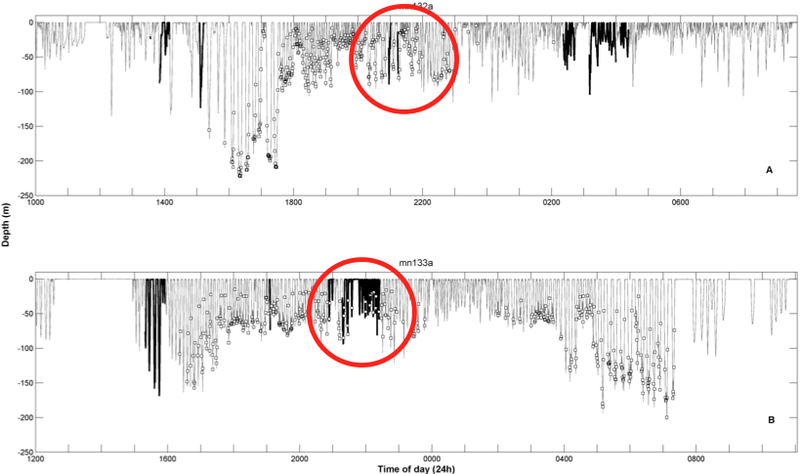 In this dive profile from two tagged whales, the thick black lines denote periods during which song was recorded. Red circles highlight locations where feeding lunges where accompanied by song! Two of the acoustic records we collected revealed intense, structured song; similar to song found on breeding grounds. Furthermore, we observed times where singing coincided with feeding lunges, indicating that either the tagged whale or its close associate was singing in areas with lots of prey worthy of feeding. To our knowledge, this is the first time singing and feeding have been observed to occur so close in time. 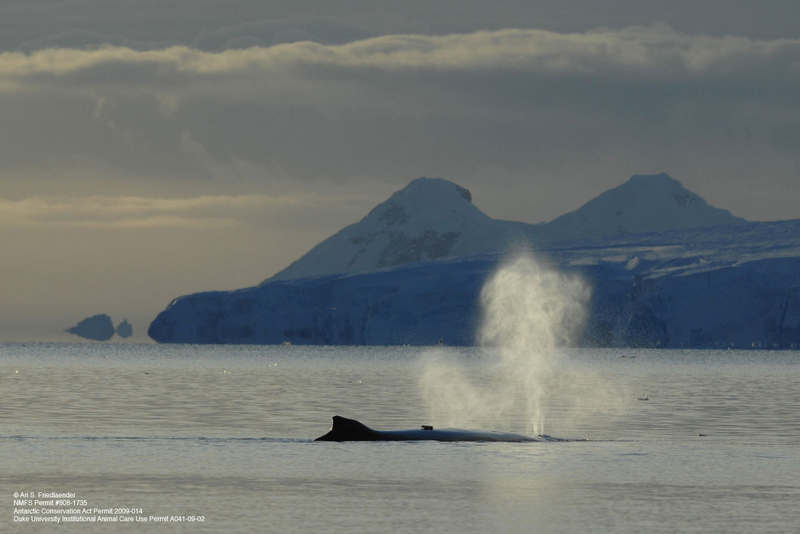 This finding provokes the question — why are humpbacks singing on foraging grounds? Perhaps our assumption that song is a behavior associated with breeding alone is false? Or perhaps breeding behavior is more flexible in terms of location than traditionally thought? Our recent paper describes the song we recorded in great detail, which will hopefully aid the further study of this behavior. Click here to read the full article, and click on this audio file to listen to an example of the song pattern we identified: Example of humpback whale song. What is your theory why humpbacks sing where they eat? Thanks for your kind words and for following my research, Kate! Thanks so much for your thoughtful feedback! I think including more images and video clips are a great idea. Some of my other posts have including some, but I will incorporate even more multi-media in future posts, per your suggestion. Thanks for reading! I will right away seize your rss as I can’t in finding your email subscription link or newsletter service. Hi, are you wanting subscribe to the http://www.turtlesinthedeep.org RSS feed? If so, just click the blue “Follow” button in the upper right-hand corner of any page. Thank you for your interest!